My wife and I bought an old house in Northern California in December of 1994. We bought it from friends, and in fact the great-grandfather of my buddy Mitch built the house himself. It's about 50 years old, and pretty groovy in its own way. It seems that Mitch's family didn't like to throw anything away. They saved pretty much everything they could - when we moved in, the garage (which never had been cleaned out. It still hasn't) looked like a storage closet. 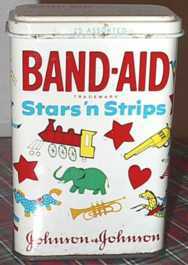 Small things, they stored in Band-Aid boxes. Stuff like nails, washers, bolts...anything that could possibly be reused. 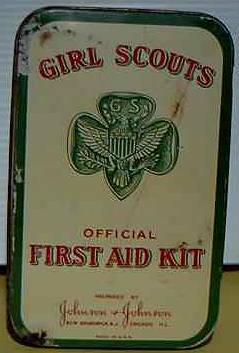 We must have unearthed two dozen boxes dating back to the 1950's. A few years after the owners died, Mitch moved in. 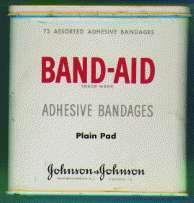 But he's a bit of a slob, so the Band-Aid boxes remained unmolested until we arrived. What could I do, but share our found bit of history with you? 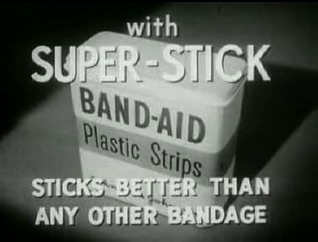 April 2005: I found two classic black-and-white Band-Aid television commercials: here's one, and the other. Feb 2005 or so: This web page quietly had its tenth birthday. 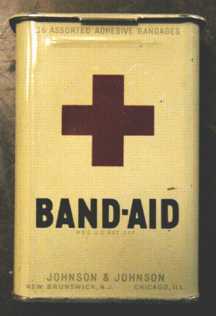 November 2000 Update: Someone sent a cover picture of Doctor Dan The Bandage Man, an old Little Golden Book that came packaged with Band-Aids. April 2000 Update: Here's a great picture sent in by David Berkebile. 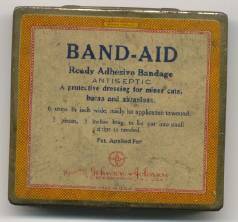 Circa 1946, when David was two and a half years old in Harlan, Iowa, having a Band-Aid applied with the help of his mother Leda and dog Snookers. 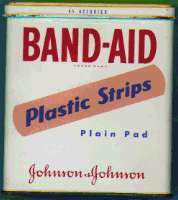 the BAND-AID manufacturing plant is located in North Brunswick, New Jersey. 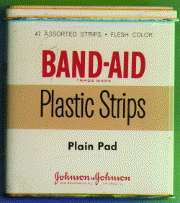 The plant was built in 1957 and has made BAND-AIDs there since that year. 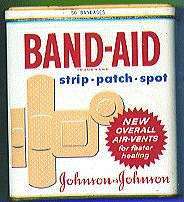 The original BAND-AID plant was 20 miles up the road at "Kilmer house." 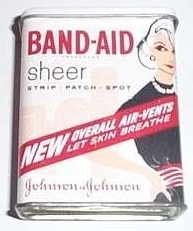 BAND-AID brand turned 75 years old in 1996. 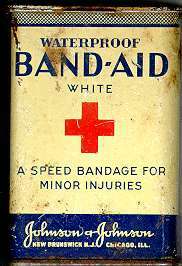 March 2008 Update: Rich Capen wrote: If you know the history, you know that the inventor - Earle Dickson - was married to a woman named Josephine Knight. 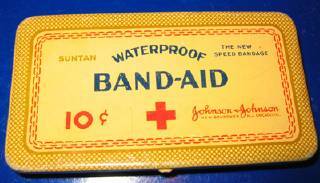 It was her clumsiness, so the story goes, that made the Band-Aids necessary. Josephine is my great aunt. She wasn't really that clumsy. ... 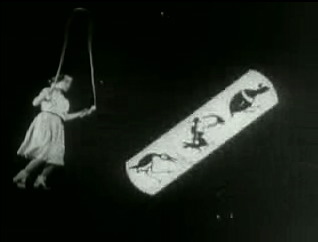 Here is a picture of Josephine Knight Dickson. 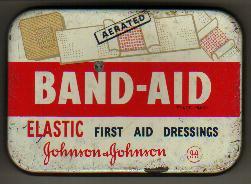 The history of Johnson & Johnson is available at the J&J web page. 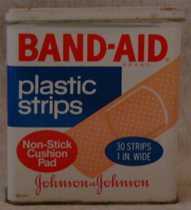 Is it an adhesive bandage? A sheer strip? 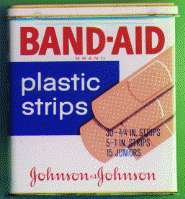 A plastic strip? 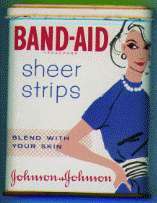 A cloth strip? 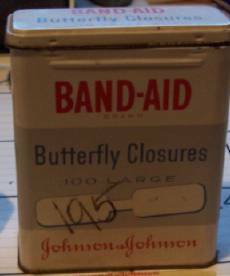 Only time can tell, and it can't seem to make a final decision in the matter...The prices of the boxes range from 47 cents to 59 cents, although some of the boxes have "33" scribbled on their lids. Price? Perhaps. It's kind of weird to look at all these boxes, not one of which has a UPC symbol on it. Unfortunately, none of the boxes have dates on them, but some are pretty easy to guess. 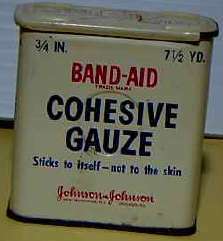 Box four is my favorite, with a certain undeniable retro '50s look. 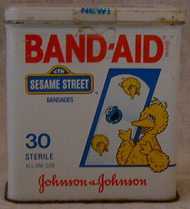 (Check out the back of that one - or any box, for that matter - by clicking on it.) Boxes are shown at 75% of their actual size. 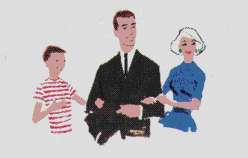 ...and this web page is not affilated with them in any way. 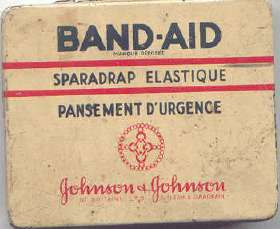 Johnson & Johnson has its own web page, which includes an interesting history of the company.